For the context of this, you should look at Random Curiosity’s review of episode 8 here, and for what I’m about to quote, original credit goes here. Essentially, this episode was about a bubbly girl author’s hopes and dreams getting hit with, as Random Curiosity’s reviewer puts it, the reality bat when faced with animation staff. 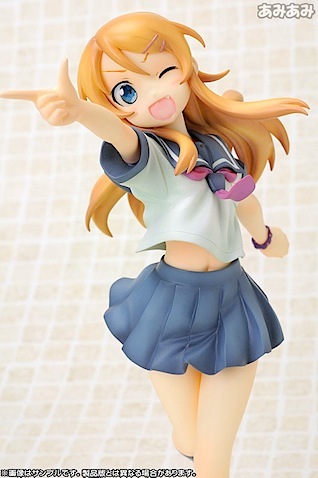 Through interventions by her loyal big brother, and also, by her friend and fellow writer “Kuroneko” (“Black Cat”), show star Kirino gets most of what she wants and is very happy – and never finds out what was done behind her back, it seems. This is in spite of Kuroneko not even liking Kirino’s style of work (and taste), but she wants Kirino’s work as an artist and creator respected because she’s a creator, too. Anyway, that’s the short version. The show goes into the issue of how works get modified, sometimes very heavily, when adapted to anime (TV or film). But, apparently the episode itself was altered compared to the novel version. More on that another time, though. The point is, Ito Makoto, the anime producer of “School Days” and “11 Eyes,” has made a Twitter statement to the effect that this OreImo episode made him distinctly uncomfortable. Basically, his point was that this is a delicate issue for producers and original authors to begin with. Why stir it up? Why portray the two sides as antagonists? In his mind, it’s a cooperative effort, not an adversarial one. I’m hardly going to call this a bad statement. I’m cursed with the ability to see all sides of any dispute. (It’s inconvenient, I tell you.) But I think that there’s a side to this that may not have been obvious when watching the show. It’s not really about the authors feeling that their works are being butchered. It’s about the fans feeling that their favorite authors’ works are being butchered… and with high irony, this includes this very anime episode, which you can see in the Random Curiosity comments (in which I have myself commented). There’s criticism that this episode strayed too far from the original author material… though there is a reason for that. Anyway, the point is, there’s mouthpiecing for the usual fan complaints that anime is too altered from the original. Surely we have all seen this. There are things where original material simply doesn’t “work” on the screen; Monster comes to mind, and yes, I have read the manga from the first volume to the bitter end. There are also works where a film is so wildly different from the original material that one wonders why anyone bothered. So, this episode took two sides. Side #1: There really are many considerations that must go into an anime version, like it or not. This includes the schedule. Of course, side #2 is what got Ito-san worked up. I understand that. But, I think that the real message was to the fans themselves. That is, be very grateful when your favorite work (like uh… Ore no Imouto Ga Konna Kawaii Wake Ga Nai, itself?) gets animated and is as close to the original material as it is, because there are a LOT of barriers in the way, not just to get a show on the air at all, but to keep it faithful. If this sounds like a backhanded apology of some sort, that’s because it kind of is. So, the real problem with being faithful to the manga plot is that it includes an anime producer plagiarizing Kirino’s work. This is an all-too-plausible situation, especially if the original work in question is part of the “doujin scene” (which is a misnomer here, since what we’d be talking about is original amateur works rather than derivative works.) So in this case Kirino’s brother comes in and saves the day. Except, apparently early this year, Dengeki Bunko, the publisher of the “Ore no Imouto” novel line, had a major plagiarism scandal of its own. A new author made a hit with a book that turned out to be a plagiarist rip-off of “Baka to Test to Shoukanjuu” (“Idiots, Tests and Summon Beasts”), which I have not read but I’ve seen its anime adaptation. It was a big scandal, all of the books were withdrawn and presumably destroyed, and the author of the plagiarist material was banished from the industry. In other words, OreImo’s own book publisher would lose a lot of face if the anime episode, through no fault of the OreImo author (who wrote this story long before the plagiarism controversy at Dengeki Bunko! ), aired a plagiarism plot that hit way too close to home for the publisher’s comfort. So, presumably – and here we must guess – the publisher turned the screws on the anime producers and forced them to make the subject matter an original anime episode, glossing over the original material while remaining faithful to the basic idea at least. So, the producers created an original anime episode about… having to create original anime episodes, doing a compromise about… doing compromises when turning works into anime. The opening theme (theme song, that is) of the show is titled Irony. This itself is ironic, is it not? So now you know… the rest of the story. …I’ve always wanted to say that line once. This entry was posted in Anime, Japanese and tagged anime, industry, insiders, Japanese, opinion, OreImo. Bookmark the permalink.